This week we cast a spotlight on the first of a list of property ETFs that investors can access via the JSE. 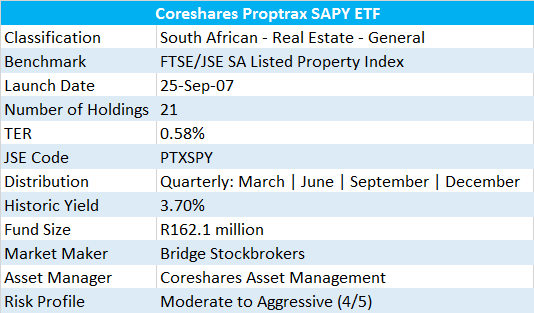 The CoreShares Proptrax SAPY ETF invests in the JSE’s 20 most liquid property companies. As part of the liquidity requirement, only property companies (mostly REITs) with a minimum free float of 15% can be invested in. This effectively means that the companies’ shares available for daily trading needs to amount to 15% of its total shares issued. Given that the ETF tracks the FTSE/JSE SA Listed Property Index, it is imperative that the fund is able to buy and sell shares in order to adjust the weighting of the underlying investments to match the changes in the benchmark index. Weightings are also skewed in favour of stocks that have bigger market capitalisation, effectively favouring the "bigger" property stocks. As you will see next week, the second of the JSE-focused Coreshares Property ETFs, the Proptrax Ten, utilises an equally weighted criteria, which treats companies of different market capitalisation equally. 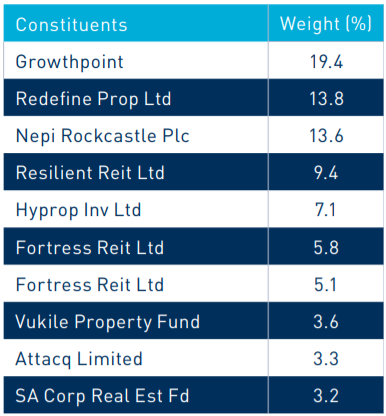 Although there are fewer investments in the Proptrax Ten than in the Proptrax SAPY, only three shares make up approximately 47% of the portfolio (Growthpoint 19.4%, Redefine 13.8% and NEPI Rockcastle 13.6%) in the Proptrax SAPY ETF. Given that almost half of the portfolio is exposed to just three counters, a higher level of conviction is required by an investor. A discussion with your financial advisor around which is the better fit for your specific context is always a good place to start. As the list provided last week shows, there are three other ETFs that track listed property on the JSE and one of these, the STANLIB SA Property ETF, also tracks the J253 index. From the outset, it is worth pointing out that the STANLIB SA Property ETF is managed at a Total Expense Ratio of 0.37% vs the CoreShares version at 0.58%. Note that the inclusion of developers like Attacq, changes the risk profile and also dilutes yield, but here again it is moderated by the smaller positions taken in these shares. 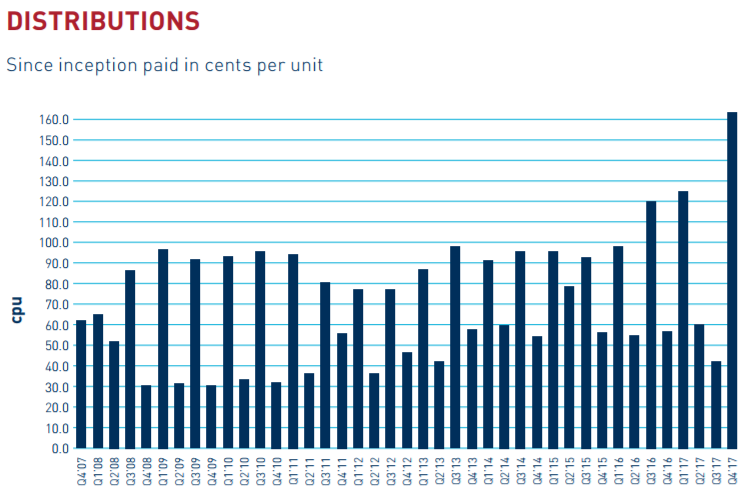 In the case of Attacq, it makes up only 3.3% as of 31 January 2018. Given the 3.7% historic yield on this ETF, many will point out how far below current bond yields this is. One needs to keep in mind, however, that property-related income streams tend to grow over time as rentals are increased on a yearly basis. Usually this increase is more than inflation and so over time, the yield grows in real terms. An index tracking fund usually falls behind the index it is tracking, due mainly to transaction and management costs as well as tracking error. Included below is the extract of performance from the ETF’s minimum disclosure document as of 31 January 2018. The share price, along with other property counters, was hit at the start of 2018. 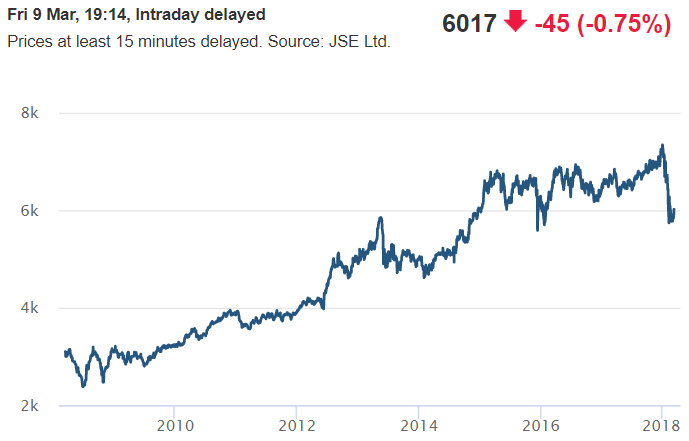 From a closing high of R73.43 at the end of December 2017, the price fell and closed at R57.40 on 6 February 2018, representing a 21.83% drop, similar to the largest 12-month drawdown experienced by the fund during the 2008 global financial crisis. It rocketed after that, and perhaps it is poised for a similar move up now?